« Weather Like A Yo-Yo! OMG – Catching Is The Word! Weather turned a little sour yesterday afternoon. By 5:00 p.m. the tornado sirens were warning Branson residents to take cover. Fortunately, the storm blew threw with minimal affect on our area and left some much needed rain. Once we get through today, tomorrow, and Friday, temperatures should return to the 50s for most, if not all of next week. We have had no generation simce last Friday. Before that, they ran three days straight. Today’s projection is for no generation all day. I expect we will see some generation this week, especially since Table Rock is at 905. Fishing has been very, very good for several day. Not a whole lots of fishers out there, but for those who are fishing, it’s more about catching than fishing. Stan had Philip, from Indiana, out yesterday until the storms ran them off. Once they honed in on a partridge and orange soft hackle, it was fish after fish. Nothing big, but lots of fish who thought they were big. Full of fight! I fished for a while and had the same experience. After I got tired of catching on soft hackles (hard to imagine), I tried a few other patterns. Everything worked! Even with the overcast day, holographic green cracklebacks were hot. Caught so many fish, my hook broke and I wondered why I was missing so many. Duh Carolyn….check your fly! Sculpins, CQs, scuds, filoplumes, rusty midge….get it in the water! Almost forgot. How about this nice 20 inch plus, plus caught by one of our customers, Scott, weekend before last on a holographic green crackleback? 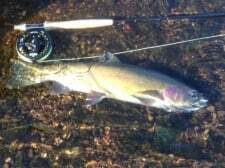 This entry was posted on Wednesday, January 30th, 2013 at 10:10 am	and is filed under Fishing Reports. You can follow any responses to this entry through the RSS 2.0 feed. You can leave a response, or trackback from your own site.